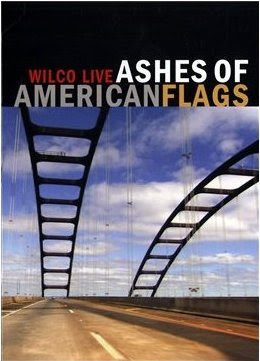 Ignorance Made Us Hungry: Responses to Wilco's "Ashes of American Flags." Wilco's new live DVD arrived in the mail yesterday (which, at the time of writing was Monday, April 20). Here are my real time responses to watching it for the first time. -Tweedy starts out in a brown leather jacket and felt cowboy hat. Brings a tear to my eye. -Very much in the visual style of Sunken Treasure: Jeff Tweedy Live In The Pacific Northwest, which means I should be in a for a treat. Rain on bus windows, intimate, close-up shots (like in the recent Rolling Stones concert film, Shine A Light). -They're only playing a sound check! To an empty room! They even sound great playing a sound check! Great choice in editing there --- revealing the empty room only partway through the song. -Nels Cline should have a five-minute solo on every song. -Alright! White, rosy Elvis-style suit for Tweedy on the next song! -I can't really believe that Glenn Kotche plays with a traditional drumstick grip. That guy is a beast. -Glenn really needs to work on his clothing style. He has long, sweaty hair, and a sort of mechanic's shirt on. He looks like he wants to deliver me a pizza. 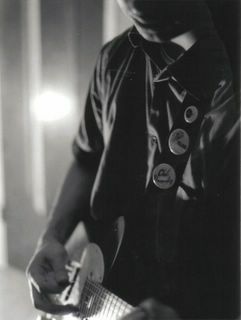 -Nels' clothing style matches his playing: smart and sharp. -Sometimes Jeff's eyes look like he's eating Sour Patch Kids when he's singing. -"Handshake Drugs" is one of the infamous three-chord Wilco songs that works SO well. I am truly baffled as to how those songs work. -Nels knows when to keep it simple. Two notes can work just as well as 200. Neil Young only needed one on "Cinnamon Girl." -Okay, Nels is back to 200 notes per second. That's cool too. -Bands are great, but once you're in them for more than a decade, you start to look like a baseball mitt. -"The Late Greats" wouldn't be one of my choices to make the cut, but it's turning out to be good. Just an absurd song. But now it's absurd... with horns. -Glenn has a frilly yellow pirate shirt that makes him look more like a flamenco dancer than a pirate. -Jeff is doing his scratchy, high-pitched scream. Weird and gross. -"Wishful Thinking" is a good chill-out song, but I hope they kick out the jams soon. -Hmm... another soundcheck song. I guess I would prefer performances with a live crowd. -I will accept "Impossible Germany" as a suitable song choice, and I will wait anxiously for great guitar sections. -The guys are lying around and complaining about what rock and roll does to their bodies. Hahaha. -Immediately following "Via Chicago," Jeff makes a perfectly placed joke about steroids. Awesome. -"War On War" is a pitch-perfect closer. Mid-tempo rocker, but it can get gritty. -Now for the bonus features. Wilco is definitely one of the finest bands I've ever seen live. It doesn't hurt that they have a very extensive, versatile catalog behind them and that it seems like they will never lose steam. Buy it. Watch it. Repeat.